I began doing intuitive, meditative, mythological, and astrological research on Lilith around 2004. As a student of astrology, I was annoyed that I could find little info on Lilith other than “she’s a demon/the mother of all demons” and the like. In 2008 I wrote the True Black Moon Lilith Natal Report, recently published by Astrolabe and available here. Then in 2012 I finished and published my book Lilith: Healing the Wild. Since then I’ve also done an mp3 intensive that builds on the material in the book, and have taught various classes and done focused Lilith readings. What I hear most often from clients, readers, and customers after they learn about my take on this archetype is that they’re empowered to let themselves be who they already knew they are. We’ve been taught over millennia to mistrust instinct and our bodies, and to give power to our linear, logical selves. We’ve also been trained to listen to others about what’s right for us. Healthy Lilith simply can’t follow others’ rules simply because those others purport to be knowledgeable or worth following. Healthy Lilith doesn’t doubt others as much as develop trust of the self. When it’s going well, others can tell or model for you whatever they wish, but the final decision maker is within you. You check the vibrations of your options and you make the choice that builds self-respect. Lilith’s energy is primal. And though this word in some circles is used to tell you to avoid it (because, after all, you should be happy that you’re civilized and not stuck in low, animal modes of living), it’s a good one for Lilith. Also add instinctive, as Lilith’s energy resides a great deal in your 1st/root chakra, the foundation of your energy field in which words and logic play little part. Your survival instinct is there, your will to live. When you get tapped into that part of you, something primal comes alive. Living intentionally with Lilith means being in your body and being in touch with some of these preverbal parts of your self, allowing the wisdom of nature that exists in your body and biochemistry to inform your life. It’s critical that we each make peace with the natural feminine within, the wild streak inside us that can’t abide by rules if they constrict what’s natural and would flow freely. And it’s critical that we move away from fearing our instinctive sides and shoving them into a dank basement within us where no light or air can reach. 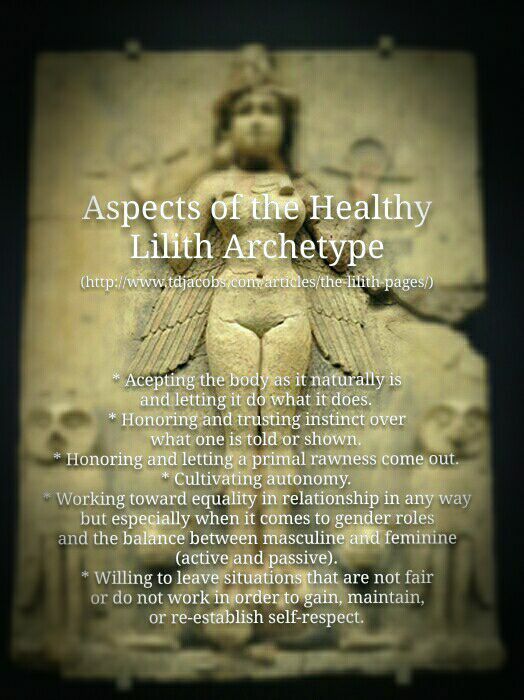 There’s more info on Lilith on my site, The Lilith Pages, including the first article I wrote in 2007 to lay out how view and work with this important archetype. Stay tuned for more posts on various aspects of Lilith, including the backstory of from where/whom I received channeled insights on Lilith I rarely discuss.